Wooden lures have an incredible history in surf fishing - a history that is rich in both cow striped bass, and plug building nuances. From shape, to weight, to paint, there are nearly endless combinations to experiment with. However, the type of wood a plug is carved from is one of the most overlooked aspects of plug building. Wood selection affects how the plug moves in the water, as well as how deep it can dive. It's certainly a factor to consider when building your first plugs. You may hear various types of wood described as hardwood or softwood. This can be confusing, since it actually refers to the types of trees from which the wood is harvested, and gives no indication of the actual properties of the wood. For example, balsa wood, which is known for being incredibly buoyant and soft, is technically classified as a hardwood. For this reason, when selecting what type of wood I want for a new lure project, I pay more attention to the actual traits of the wood, such as that species' specific gravity. Specific gravity is a measure of the density of a wood, relative to the density of water, and can give you a solid indication of how a wood will act when in the water. 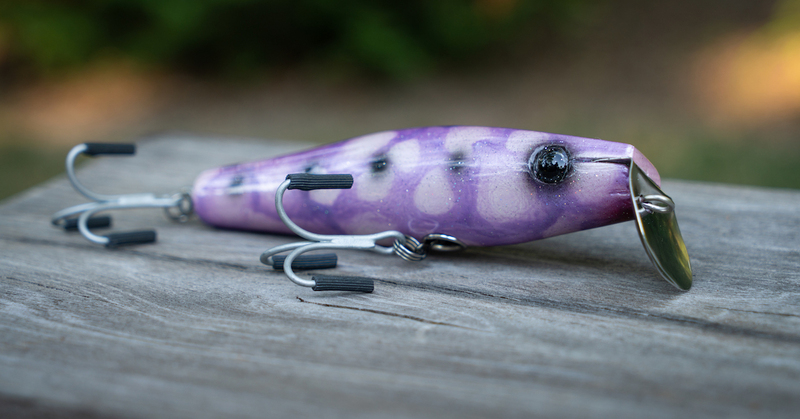 When choosing which wood to use, the first question asked should be, "What do I want the lure to do?" 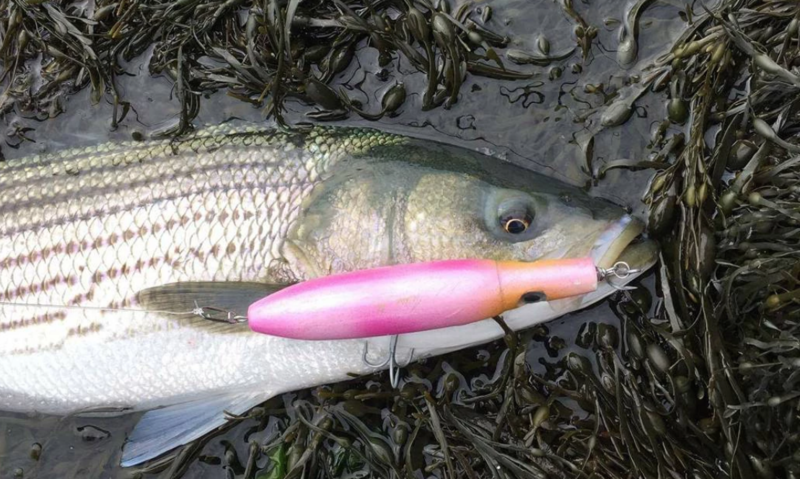 This striped bass fell to a "squid spook" built by the author. Basswood, pine, balsawood or cedar are good choices for spook-style lures. Let's start with topwater lures. 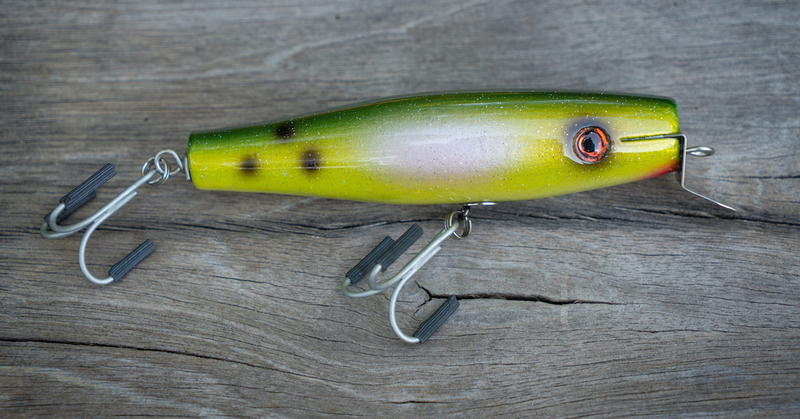 There are a number of different types of topwater lures, such as pencil poppers, polaris poppers, spooks, or surface swimmers, like a surfster. These are lures which are designed to generate commotion on the surface and entice fish to strike. 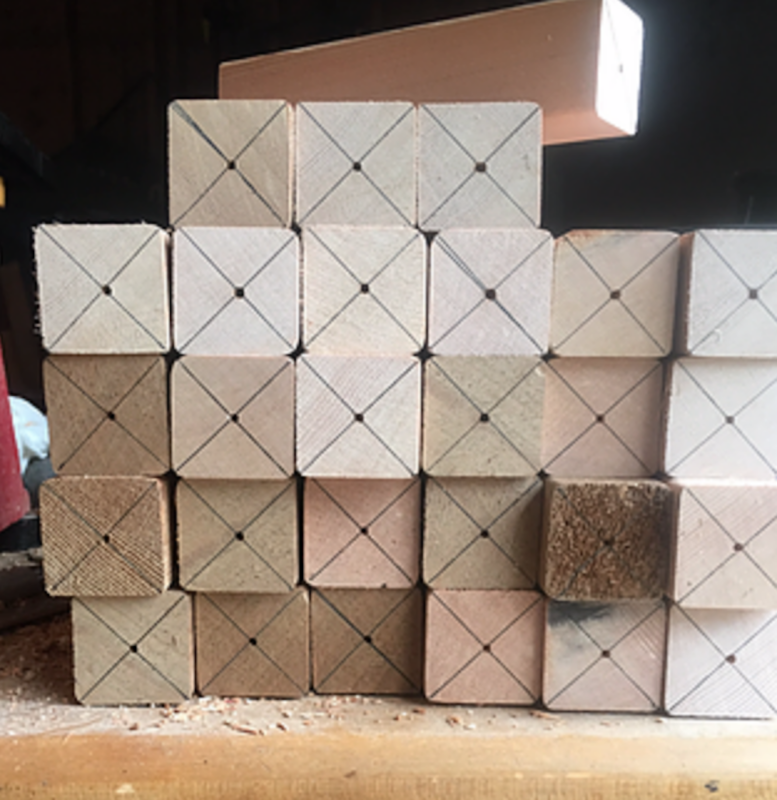 When building a plug whose purpose is to stay on the surface, you will want a wood with a lower specific gravity, such as basswood, pine, balsawood, or a cedar wood. These specific species of wood also tend to be easily influenced by any weights inserted into the wood. This makes them ideal for topwater lures, due to the fact that topwater plugs often require lead weights to be inserted, creating their action, such as the heavy tail weight of a pencil popper, or the chin weight of a surfster. A "Washed Ashore Fishing" Surfster, built and painted by the author. These species of wood will also create a "faster" action, appearing to be more lively in the water, when used to build metal lip swimmers. With the right shape, weighting, and metal lip these species of wood can also be used to build many styles of subsurface swimmer. Hard maple and birch are the perfect choice for darters, needlefish and other sinking lures. What if you want your lure to sink, or dive deep in the water column? When this is the case, a buoyant wood hardly seems like an appropriate choice. This is where woods with a higher specific gravity come into play. The most popular woods in this category are hard maple and birch. These woods are less lively in the water, and require less weight to be added to make them sink. Many of the all-time great lure builders often chose these woods for their deep diving metal lip swimmers. For example, Donny Musso and Danny Pichney famously used maple wood to build their large, deep diving plugs. Hard maple and birch are also the perfect choice for fast sinking needlefish. 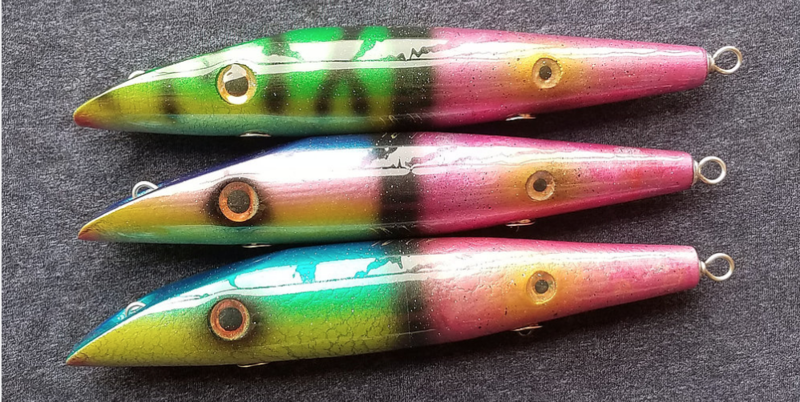 These types of wood are also extremely popular for building darter lures, which characteristically have a slower, yet unpredictable, subsurface action. Many plugs turned today, are made out of cedar, for several important reasons. First, the lower specific gravity of cedar gives cedar lures a "livelier" action than other woods with higher specific gravities. Second, cedar isn't prone to splitting, especially in comparison to its hardwood alternatives. A "Washed Ashore Fishing" metal lip swimmer, created by the author. In addition, cedar woods are naturally water and rot resistant. While you will still need to seal a plug built with cedar, it can be a more forgiving process due to this natural resistance. In conclusion, I hope this mini-tutorial has helped you decide which wood is right for your next plug project. Please let me know what you think by commenting below! Connor has two goals; to build the best custom wood lures possible, and to help you catch more fish! Connor’s business is called “Washed Ashore Fishing” and some of his most popular plugs include the Slim Eel Swimmer and the Small Surfster. Very interesting – nice to know which types of wood are best for durability, fishing on the surface and diving lures. Good information. I’d like to try my hand at building a plug. 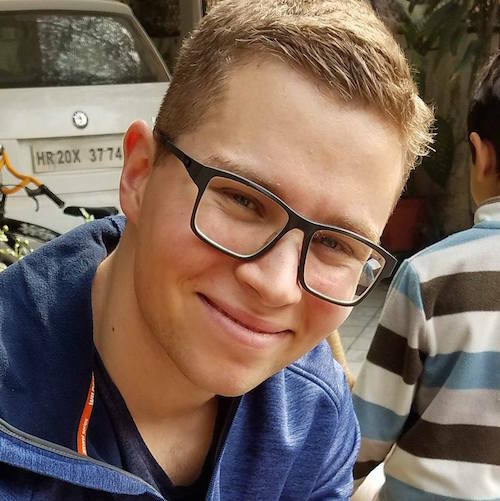 What resources would be best for a first time project? Thank you for the kind words! That’s a great question, and unfortunately I don’t really think I’ve seen too many resources specific to guys just getting started. There are a good number of how-to’s floating around on various forums, websites, and youtube that a quick google search will dig up, but most that I’ve seen really just walk you through how guys are building baits using a shop full of expensive tools. While these guides and resources are full of quality information, I don’t think they really provide solid footing for someone who might not necessarily have those tools already. In reality, all you really need is a drill, a saw, and some sandpaper to get started. I’ve been meaning to put together something like this, maybe a weekly step-by-step or “build along” type process?